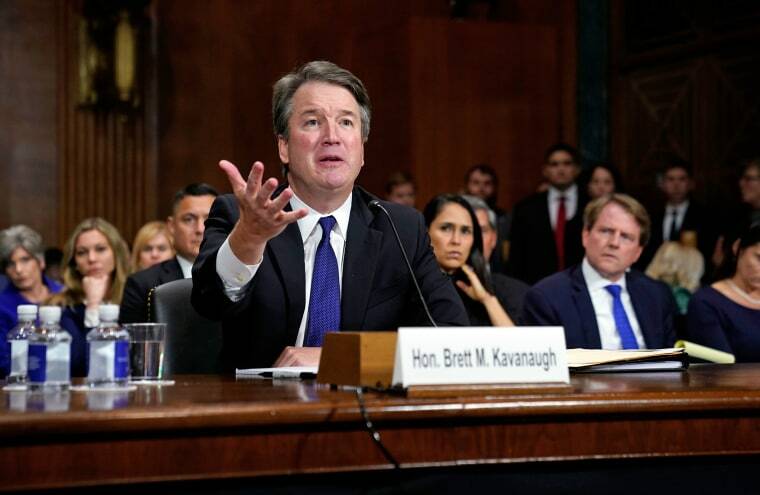 Gowri Ramachandran and James Sample: Brett Kavanaugh lied brazenly and repeatedly under oath. Any law student knows he cannot sit on the Supreme Court. Gowri Ramachandran and James Sample Brett Kavanaugh lied brazenly and repeatedly under oath. Any law student knows he cannot sit on the Supreme Court. It feels self-evident, but a judge who cannot obey the law cannot be expected to apply it. For a nominee to the nation’s highest court, an arms-length relationship with truth ought to be disqualifying in itself. Period. Many Americans, whether as private citizens or in professional capacities, struggle in the modern news cycle of hot-takes, not to be mental prisoners of the moment. Last week's Senate Judiciary Hearing hearing was not mere reality TV so much as a critical inflection point for our nation’s commitment to the rule of law. It is especially important to reflect today on just how fundamental the role of Supreme Court judges are in promoting faith in the American legal system — and as such, the concept of justice itself. Where would we be as nation if that faith were to be undermined or worse, eradicated? Socrates is widely attributed with the saying: “Four things belong to a judge: to hear courteously; to answer wisely; to consider soberly; and to decide impartially.” By this Socratic standard, Judge Brett Kavanaugh failed on all four points during his testimony last week. His remarks were completely antithetical to the values we demand from our jurists. Could Kavanaugh's misleading statements derail his confirmation? Exactly what happened in Bethesda, Maryland three decades ago can never be precisely known given the passage of time. What happened in Washington, D.C. mere days ago, however, was easy for reasonable persons to determine: Kavanaugh lied. Repeatedly. Under oath. Indeed, Judge Kavanaugh would never accept the rampant misrepresentations of truth that Witness Kavanaugh offered in front of U.S. senators. Even if one takes the position that Dr. Christine Blasey Ford’s highly credible allegations of sexual misconduct shouldn’t derail Kavanaugh’s nomination, his response to them should. Why? Because, as many have detailed carefully and thoughtfully, he lied, misled, displayed extraordinary partisan animus straying at times toward unhinged conspiracy theorizing. The sheer scope of Kavanaugh’s dishonesty under oath has been detailed in numerous articles, perhaps none as exquisitely comprehensive as Nathan J. Robinson’s essay in Current Affairs. Honesty is important in any job, of course, but for the particular job Kavanaugh seeks, truth is utterly paramount and non-negotiable. Honesty is important in any job, of course, but for the particular job Kavanaugh seeks, truth is utterly paramount and non-negotiable. Has our political tribalism really become so acute as to render foundational maxims such as the Canons controversial? If so, then truly the loss will be felt by both Democrats and Republicans equally. Kavanaugh is certainly in an incredibly difficult circumstance, both personally and professionally. Yet every single day in American courtrooms, individuals with far fewer resources, far less expertise and arguably far more at stake than a mere promotion are held to the highest standards of candor, truth, tone and veracity. Why? Because without truth, the system falls apart. This is why we instruct our law students that the Model Rules of Professional Conduct governing attorneys require them to be open and honest. An appellate attorney, for instance, must never mislead the court about what the record at trial says or does not say. People on trial or in litigation stand to lose their livelihoods, their homes, their children and even their liberties. This is why judges, as representatives of our nation’s commitment to the rule of law, impose criminal penalties for lying under oath. It feels self-evident, but a judge who cannot obey the law cannot be expected to apply it. Shifting constraints aside, no investigation is conceivably “comprehensive” without exacting scrutiny of Kavanaugh’s testimony not merely for credibility concerns, but for the federal crime of perjury. Yet, thanks in large part to the media, we don’t need the FBI to reveal that neither Kavanaugh’s categorical statements nor his obfuscations are aging well. As Jonathan Chait powerfully writes in New York Magazine, Kavanaugh’s opening statement “was intended to rally his party with red-meat partisan rhetoric, and lead directly to a rapid vote in a tribalistic fashion. It was not intended to survive a week of close factual scrutiny by the media or potentially the FBI.” With a life tenure hanging in the balance, and a compressed time frame, the oft-beleaguered media deserves credit for attempting to do the work that the administration initially seemed wholly uninterested in pursuing. In these partisan times, it is unrealistic to expect a bipartisan consensus as to the allegations of sexual assault. Speaking for ourselves, we found Dr. Ford deeply credible, compelling and authentic. We recognize that others disagree. But ultimately, a judge’s personal commitment to the truth remains a job requirement. Does being an entitled teenager who drinks too much in high school and college disqualify one from the Supreme Court? No. But lying repeatedly and brazenly under oath should. Gowri Ramachandran is a professor of constitutional law at Southwestern Law School. She previously served as a visiting professor at the University of California, Berkeley School of Law in 2009. James Sample is a professor of constitutional law at Hofstra Law School. He is a co-author, with James J. Alfini and Charles G. Geyh, of the forthcoming sixth edition of Judicial Conduct and Ethics, published by LexisNexis.